17 Month Baby Signer Old Can Read! Have you heard about the 17 month old Elizabeth Barrett in the news lately? Seventeen month old Elizabeth Barrett is linguistically superior to her peers. Because of this, she and her parents have gained national attention. Katy and Michael Barrett have an advantage over most parents when they started teaching Elizabeth language; both Mom and Dad are Speech Pathologists. Their profession includes, but is not limited to, diagnosis, management, screening, prevention, and treatment of any speech, language, or communication disorder. 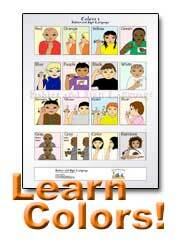 Every day, they work with language on a much deeper cognitive level to help people with language disorders. Elizabeth has no such disorder, but that didn't stop Katy and Michael from using their profession training to help develop her language skills. Since she was 14 months old, Elizabeth has been able to read words like a 7 year old. There are many different avenues Katy and Michael used to facilitate their daughter's learning, one of which was the use of American Sign Language since she was born just over a year ago. Katy believes that using sign language with Elizabeth was one of the major contributors to her success with grasping language at such an early age. Elizabeth's only exposure to television is a PBS show called "Signing Times". 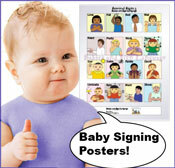 You can read our review of the "Signing Times" baby sign language DVDs here. "Signing Time," as the name suggests, teaches children and adults different signs for everyday life, further reinforcing language acquisition. Elizabeth was able to use baby sign language and match words and meanings with the appropriate signs. Babies who learn sign language are able to effectively communicate ideas before they can talk. With her parents signing to her and her love of "Signing Time," her sign language skills grew stronger, which in turn, helped her brain to lock in on English.